The hackerspace Noisebridge is one of San Francisco’s cultural and artistic gems. Its members have contributed a wide variety of art, hacks and local culture. 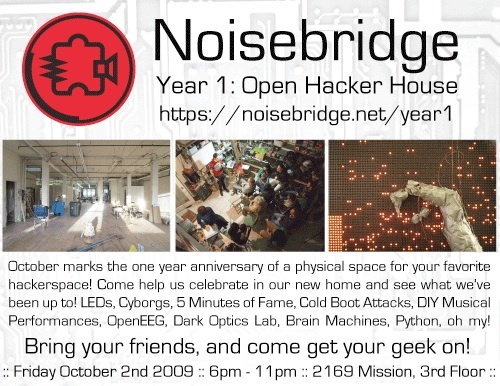 Noisebridge is a space for sharing, creation, collaboration, research, development, mentoring, and of course, learning. Noisebridge is also more than a physical space, it’s a community with roots extending around the world. We help people build neat and awesome things. Also at the event will be the Reverse Engineering Bar with only the geekiest of drinks and music by DIY-band Corpus Callosum and Cally McMorrow, circuit bender of legend.